London, 3 December 2017 – Get ready for yet another big celebration that aims to bring together all 3D printing enthusiasts, regardless of their geographical location. We’re here to make it a day to remember. And since we’re known for celebrating various occasions for more than just one day, Global 3D Printing Day is no exception. What can you expect from 3D Printing Day? We kick off the celebration on 3 December 2017 with a 3D printing campaign designed for all our customers. 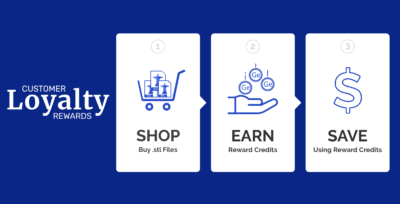 Our MoneyBack Reward Campaign has been a success and got you very engaged. However, we decided to wrap it up but we have prepared something else for you. This time we’re challenging you to post videos of your 3D prints on our Facebook Group wall using the same hashtag #Gambody3DPrints. Watermark the video with the hashtag #Gambody3DPrints, or simply write the hashtag on a piece of paper and place it next to the miniature, so that it is visible in the video. 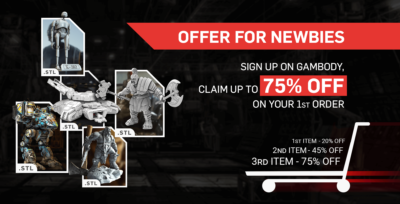 For every video showcasing the 3D printing miniature and meeting all the conditions described in this post, you can claim 50% of the 3D model’s price* to your Gambody account. *Model’s price is the money you pay for 3D printing files that does not include the credit from your Gambody account balance or discounts from Gambody campaigns. What videos are not eligible? Videos of the 3D printing process. 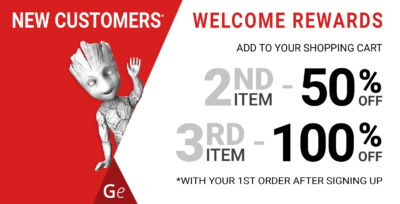 You still can post pictures of the 3D printing miniatures on our Facebook Group wall using the hashtag #Gambody3DPrints, but now you will be eligible to claim only 25% of the model’s price to your Gambody account. Bonus: If you have previously (before December 3, 2017) posted a picture of the 3D printed model with the hashtag and you’ve successfully been awarded 50% of the model’s price, you can now upload a video of the same 3D print and get the other 50% of the model’s price. It means that the 3D model’s price will equal $ 0. Note: The rewards are not cumulative and the highest amount you can claim back is 50% of the model’s price. 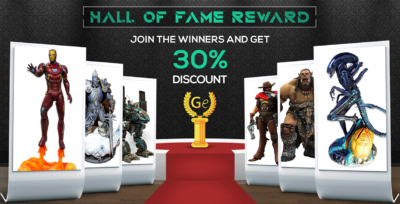 if you post the picture first and later the video, then you get first 25% of the model’s price and later on another 25% to your Gambody account balance. Important: Don’t forget to use the hashtag in the video. If the video misses the hashtag, it will not be eligible for claiming the 50% of the model’s price. It’s the first time Gambody celebrates Global 3D Printing Day and we want it to make it memorable with your help. We look forward to seeing your short videos on our Facebook Group.